Illustration of a nanoscale experiment. In the weird world of quantum mechanics, sub-atomic particles such as electrons and photons behave in strange ways that make no sense on the human scale. One of the counter-intuitive concepts of quantum mechanics is the uncertainty principle, which says that you can't pin a particle down. That means at any given moment, you can't know exactly both a particle's position and its momentum. Instead, you have only probabilities that it is located in any given place at a certain time, or moving in a certain direction at a certain speed. "At the quantum level, it is generally not possible to predict the exact outcome of a measurement," said Manuel A. Castellanos-Beltran of JILA and the University of Colorado, Boulder. "This inherent randomness in the measurement of a quantum state is called quantum noise." And noise is bad, especially when you're trying to take extremely sensitive measurements. In the same way that it's impossible to hear the person talking next to you during a rousing football match, quantum noise makes it harder to accurately measure electronic signals. Over the last 10 years or so, scientists have learned to "squeeze" light waves to shut out most of the quantum noise caused by the random movements of photons. Now, Castellanos-Beltran and a team of scientists supported in part by the National Science Foundation have developed an amplifier that squeezes the quantum noise of microwaves. Microwaves are a form of energy with longer wavelengths than visible light, falling between infrared and radio waves on the electromagnetic spectrum. The researchers were using microwaves to study the miniscule movements of a nanometer-scale beam. But the microwave signals were so small they needed amplification in order to be measured. "Most amplifiers introduce additional noise that is much bigger than the quantum noise," said Castellanos-Beltran. "In experiments done in our lab, the accuracy of measurements was limited by the noise of commercial amplifiers. We needed to build an amplifier to dramatically improve the sensitivity of these measurements." The team reported their results in an article published in Nature Physics. The new amplifier works over a range of microwave frequencies from 4 gigahertz to 8 GHz. And it adds only a small amount of noise by "squeezing" the signals' quantum noise. Like waves on the ocean, microwave signals flowing through an electronic circuit can be described by two components-their phase (timing of the wave) and their amplitude (strength, or height of the wave). To understand how squeezing can reduce the quantum noise in an electromagnetic wave, hold a small, squishy "stress ball" in your palm and squeeze it hard. The ball will deform, becoming longer in one direction and thinner in the other. The length component has increased, but the width component has decreased-or in other words, been squeezed. So why is an amplifier that can squeeze one component of the signal noise useful? It's another example of the perverse nature of the quantum world, according to Castellanos-Beltran. "If one attempts to amplify both components of a signal, quantum mechanics requires that you not only amplify the noise already present, but you also add additional noise, which was not present in the original signal," he said. "However, quantum mechanics does not require that an amplifier that amplifies just one component of a signal add any additional noise." As a result, the unamplified or "squeezed" component suppresses the effect of quantum noise, making it a useful tool for precision measurements, Castellanos-Beltran said. To squeeze the electronic signals, the researchers built a "metamaterial," which is an artificial material engineered to have unique properties not found in nature. The metamaterial is built on a coplanar waveguide--a one-dimensional metal transmission strip built on a silicon chip. The strip transmits microwave signals just like an optical fiber transmits pulses of light. Inside the waveguide the researchers arranged 480 nano-scale SQUIDs, or superconducting quantum interference devices. Superconductors are materials that can conduct electricity with almost no loss of current. Most superconductors only work at near absolute zero, so the researchers kept things cold. Each SQUID in the amplifier consists of a pair of Josephson junctions. "A Josephson junction is a circuit element made of two superconducting pieces of metal separated by an insulator," said Castellanos-Beltran. 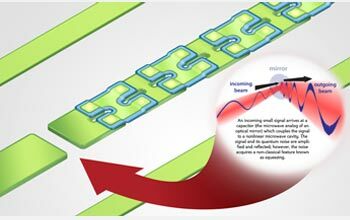 The Josephson junction relies on "tunneling," another of those quirky concepts of quantum mechanics. Under the right conditions, electrons can tunnel through an otherwise solid barrier, in this case the insulator. As the electrons move back and forth through the barrier, they create a steady electric current, with zero voltage. However, when a voltage is added across the circuit, by applying a magnetic field nearby, the tunneling stops. Scientists can use this so-called "Josephson effect" to detect and measure extremely weak magnetic fields. "One of the limitations in previous amplifiers using Josephson junctions was that they only worked over a narrow frequency window," said Castellanos-Beltran. "In our case, this is still true. However, because our metamaterial is tunable, we can adjust the frequency where the amplifier operates to anywhere between 4 and 8 GHz." In addition to measuring energy fields, the researchers stumbled on another possible application for their new amplifier-quantum computing. "One promising proposal for quantum computing is to measure the state of a qubit (or quantum bit) by amplifying a microwave signal," said Castellanos-Beltran. "Because our amplifier is so accurate and fast, it could be used to measure the state of a qubit with near certainty." The amplifier does add a small amount of noise. "We do not know the origin of this extra noise, but one of our near-term goals is to understand this non-ideal behavior," Castellanos-Beltran said. The National Science Foundation (NSF) is an independent federal agency created by Congress in 1950 "to promote the progress of science; to advance the national health, prosperity, and welfare; to secure the national defense…" With an annual budget of about $6.06 billion, we are the funding source for approximately 20 percent of all federally supported basic research conducted by America's colleges and universities. In many fields such as mathematics, computer science and the social sciences, NSF is the major source of federal backing.